Who uses the keyboard anyway? Blind or visually impaired users of your website may be unable to use a mouse or other pointing device. The same is true of some users with motor impairments. These people may rely on keystrokes to interact with a site and to access the content. 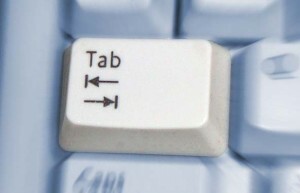 For these users the tab key will get a lot of use as it allows the focus on the page to move from one link or form element to the next. However many large sites can have a lot of links near the top of the page – for example in a navigation row beneath the header, or as a navigation column to the left (usually) of the main content of the page. Typically the default tab order of the page will mean that a user will need to use the tab key many, many times through all the navigation links before they reach the actual content. This can be off-putting to say the least. And remember sites with a poor usability experience will not keep their visitors for as long. When people arrive at a page on your site they will have done so either from a bookmark, by following a link from another page or from a search engine query. Whichever way they arrive, the content of you page is what they’re after. Once they’ve read and absorbed the content they may be ready to move to somewhere else on your site. Only now do the navigation links on your site become useful. Forcing users to tab through all the navigation links before they reach the content becomes a chore. One solution is to provide skip links (aka jump links) which allow users to jump straight to the content (or other key areas within a page too if you think appropriate). In the same vein a link to the top of your main site navigation is a good idea too. It is sensible to position such links right at the top of the page so that they come first in the tab order of the page. Also, screen reader users can quickly return to the top of a page to access the links once they’ve read your content. Some web designers and site owners may not wish the designs of their site to be cluttered by links right at the top of the page. But not to worry, it is possible to hide the links and then make them visible only if they’re tabbed to. If you need to know how to do this, read on. In an earlier post (Text for Screen Readers Only) I presented a CSS technique for making text invisible but still accessible by screen readers. We’re going to use that technique here but with some added CSS properties that make the links visible when they get tabbed to. The first definition places the link way to the left of the visual area of the page – you can style the link to your own requirements but make it noticeable. The second definition is they key one and makes the link visible at the top of the page when it’s tabbed to. And here is the finished effect – examples from this website. The default tab order of links and form elements on a page follows the order they appear in the HTML that the browser uses to render the page (unless you override this). Some sites – including this one – place the page content as close to the top of the HTML as they can and before all the navigation links. The idea here is to follow the page psychology I mentioned earlier – ie the content here is initially more important than links away. A future post will look in more detail about the order of content within web pages. Was this post helpful to you? Got a different view? In either case we’d love to hear from you. Why not leave a comment? Well-written article very easy to follow.